The NoSQL database movement came about to address the shortcomings of relational databases and the demands of modern software development. MongoDB is the leading NoSQL database, with significant adoption among the Fortune 500 and Global 500. Although it is challenging to quantify database adoption and market share, there are a number of metrics — such as Google searches and job postings — that illustrate MongoDB's leadership. Some of these metrics are captured below. Google search provides a broad indicator of NoSQL adoption. Using Google Trends, a comparison of Google search volume for MongoDB and other NoSQL databases from 2009 - 2013 illustrates MongoDB's popularity. MongoDB has nearly 3 times as many Google searches as the next most prevalent NoSQL technology, and nearly 10 times as many searches as the least prevalent database. Since 2011, the 451 Group has analyzed the relative adoption of NoSQL technologies based on LinkedIn data. Specifically, it examines the number of LinkedIn members who list each database in their profiles. Since the introduction of the analysis, MongoDB has been the highest-ranking NoSQL database. MongoDB accounts for nearly half of all mentions of NoSQL technologies in LinkedIn profiles. 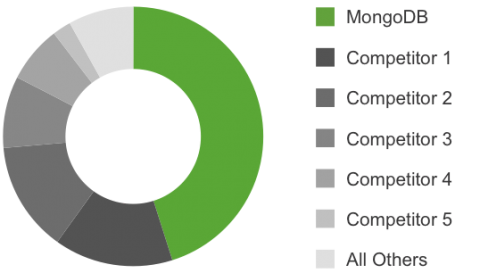 MongoDB adoption is greater than that of the next 3 NoSQL databases combined, and grew more quarter-over-quarter and year-over-year than any other database in consideration. Business intelligence (BI) software vendor, Jaspersoft, publishes the Big Data Index, which measures demand for the most popular technologies for storing and analyzing big data. The Big Data Index is based on the total number of connector downloads from Jaspersoft’s open-source, community-focused web site. In 2012, document stores received over 70 percent of demand overall. Not only was MongoDB the top performer in this group, but since the report first came out in 2011, MongoDB has been the #1 big data source overall in the Big Data Index. Job-finding search engine Indeed.com provides another indicator of MongoDB's dominance through Indeed's Top Job Trends, a report that analyzes the top skills sought by employers. Indeed analyzes millions of job postings per year to identify the fastest-growing skills. These cover a range of areas like NoSQL, mobile and social media. 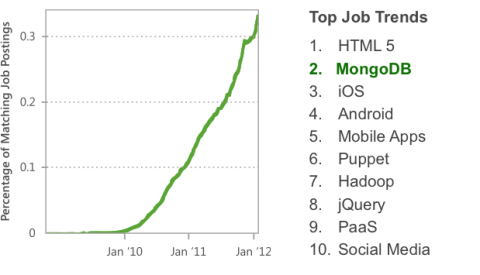 Since 2010, MongoDB has been second only to HTML5 and ahead of iOS, Android and Hadoop. MongoDB has been #1 in the NoSQL category. This not only demonstrates MongoDB's strong position in the NoSQL space, but also its technological leadership overall. MongoDB is recognized as the leading NoSQL database it delivers faster time to market, higher developer productivity, and better developer experience. Its features include a JSON data model with dynamic schemas, extensive driver support, auto-sharding, built-in replication and high availability, full and flexible index support, rich queries, aggregation, in-place updates and GridFS for large file storage.